Stretchcam is a thin camera with a lens capable of zooming with small actuations. 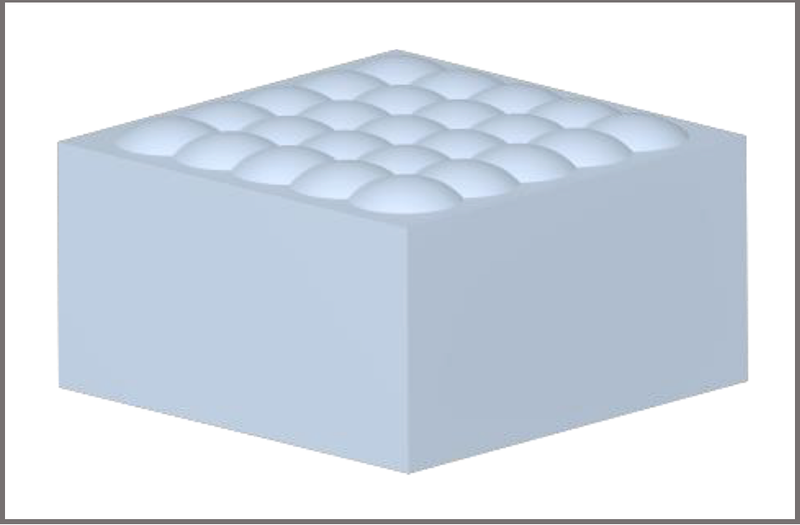 In our design, an elastic lens array is placed on top of a sparse, rigid array of pixels. This lens array is then stretched using a small mechanical motion in order to change the field of view of the system. We present in this paper the characterization of such a system and simulations which demonstrate the capabilities of stretchcam. We follow this with the presentation of images captured from a prototype device of the proposed design. Our prototype system is able to achieve 1.5 times zoom when the scene is only 300 mm away with only a 3% change of the lens array's original length. 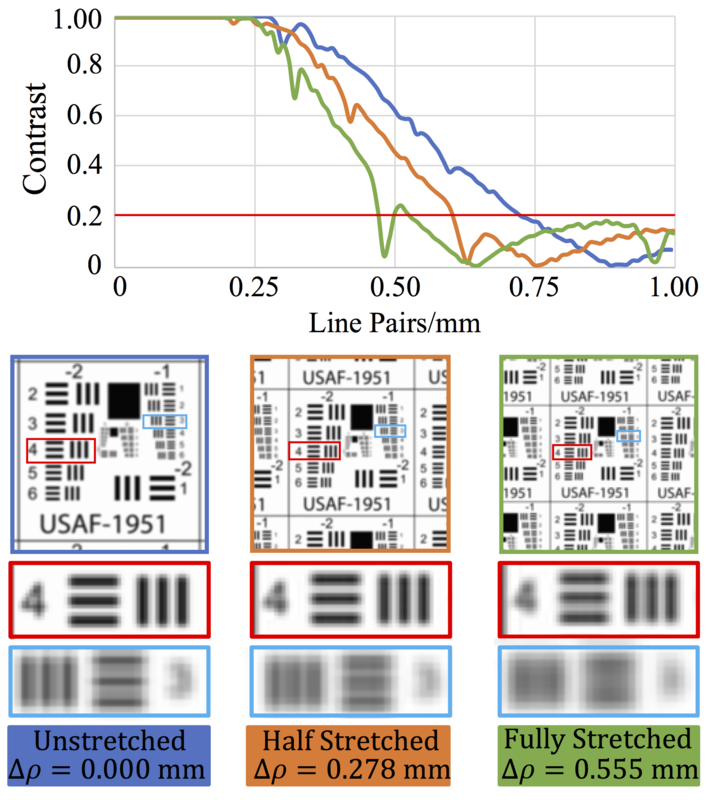 "Stretchcam: Zooming Using Thin, Elastic Optics,"
A visualization of the camera architecture. 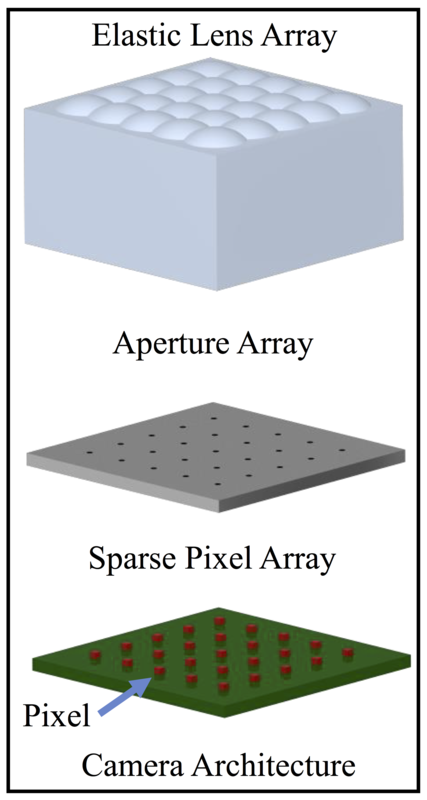 An aperture array is placed on top of a sparse pixel array, then an elastic lens array, whose pitch is equal to the pitch of the sparse pixel array is placed on top of the aperture plate. The unstretched and stretched configurations of Stretchcam are presented in this figure. 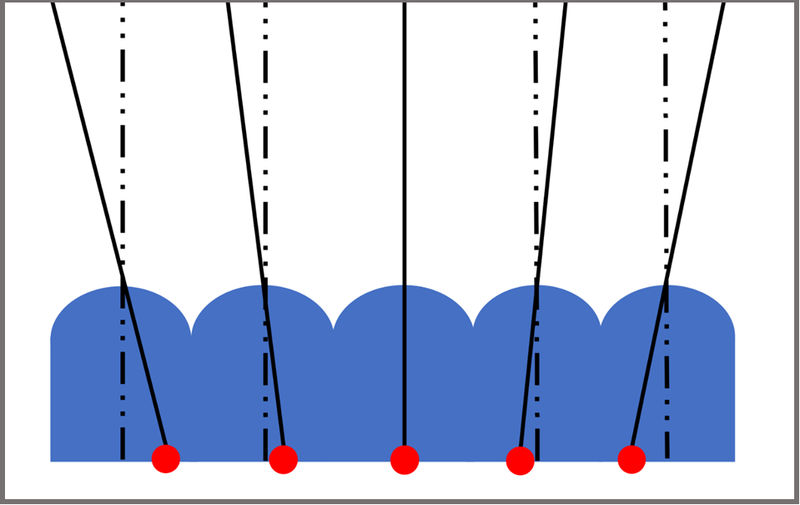 The lens array (blue) placed on top of a sparse array of pixels (red) whose pitch is equal to the lens array's. Stretching the lens will change the angle between the primary ray and the optical axis of each lens (black line). In (a), the pixels are coincident with the optical axis of its corresponding lens and, in turn, the primary ray for each lens in the array is coincident with the optical axis of its corresponding lens. 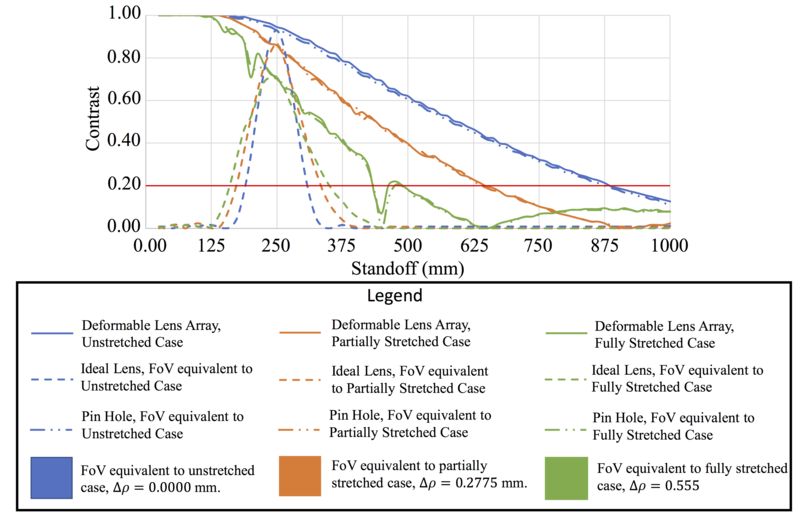 In (b), the elastic lens array is stretched a small amount causing an increase in field of view of the imaging system. 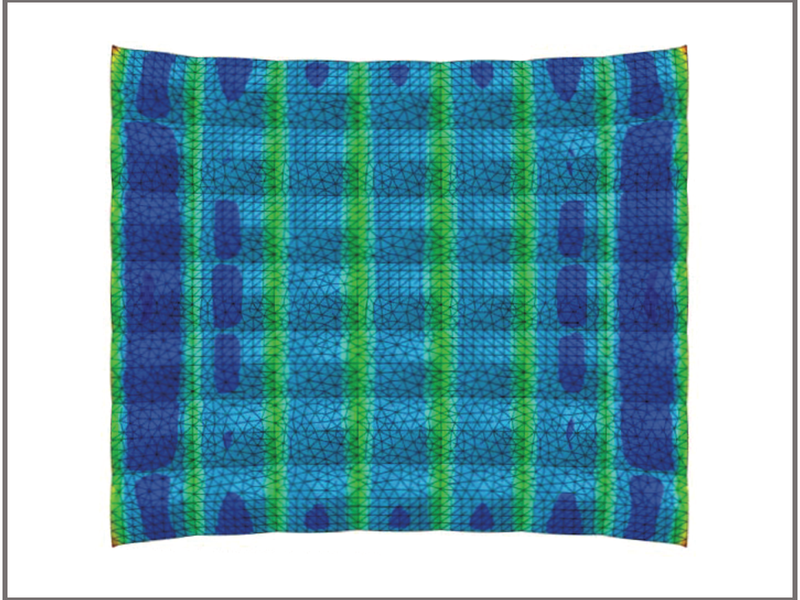 This is a Abaqus simulation of a 7 by 7 lens array with 7 mm by 7 mm wide lenses stretched by 1 lens length. While there is unevenness in the stress distribution at the edge of the array, the 3 center columns and 5 center rows all respond the same. 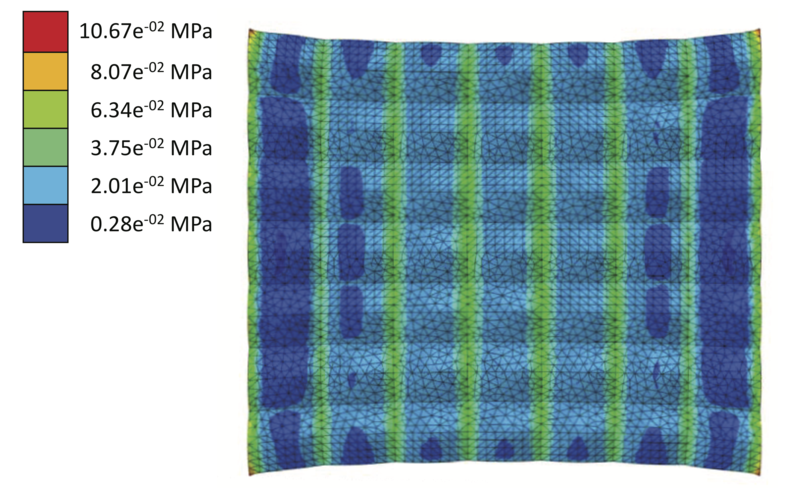 This small scale test confirms that we can assume the deformation of the individual lenses is universe away from the boundaries. This figure shows the frequency response of the lens array at the designed focal plane, 250 mm. Notice how some line pairs remain distinguishable at all stages of the lens array's deformation while others are blurred. This is due to the decreasing Nyquist frequency of the system as the lens is stretched. 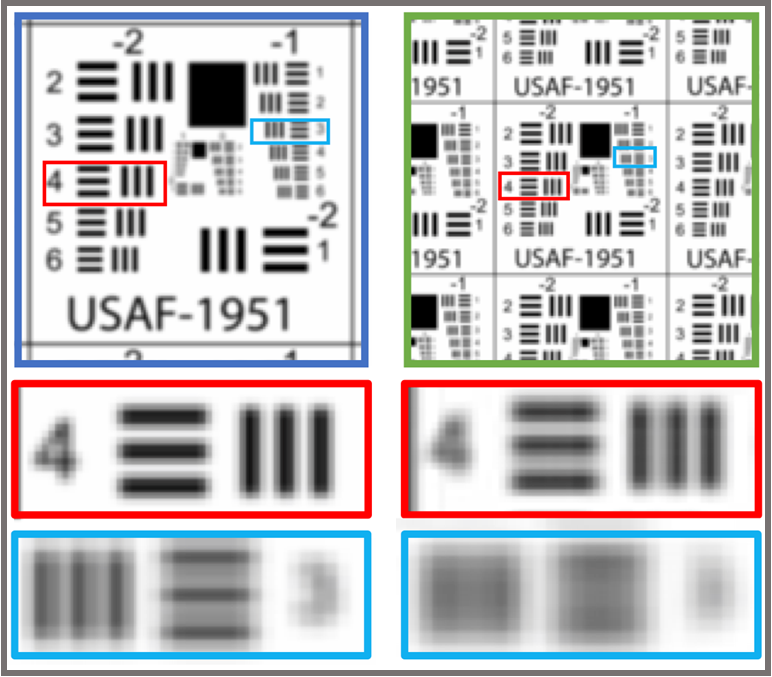 USAF-1951 targets are provided that give a visual representation of the same data. 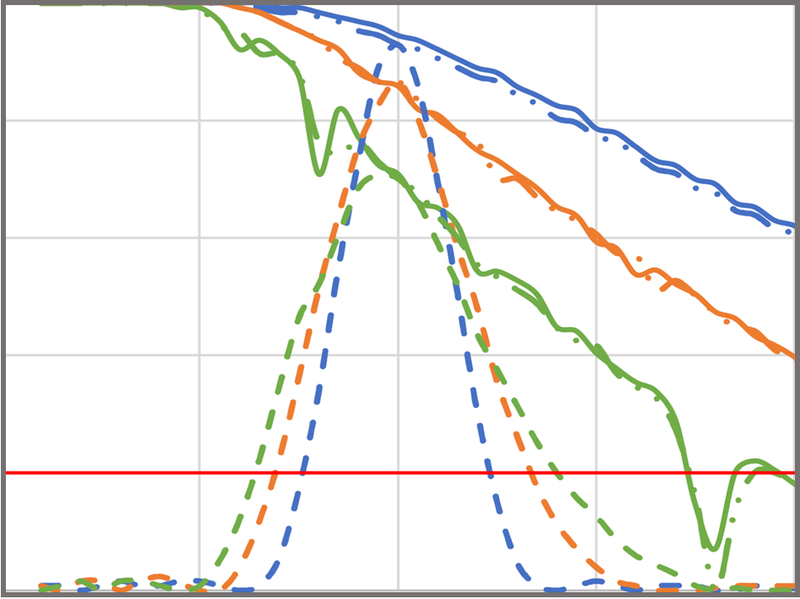 Despite some frequencies falling under the contrast threshold, there is a set of frequencies common to all deformation cases that is captured with acceptable contrast. This version of Stretchcam is able to achieve a two times zoom with only a 0.555 mm stretch and is able to capture 0.354 lp/mm throughout the stretch. 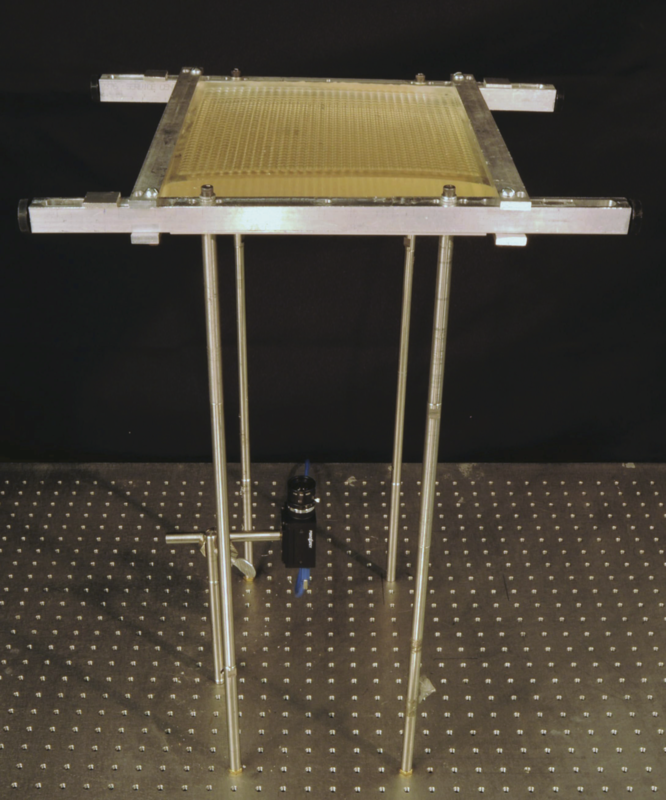 This image details the experimental apparatus. The stretching of the lens array is controlled using a spreader-like mechanism with two clamps on either side of the lens array. 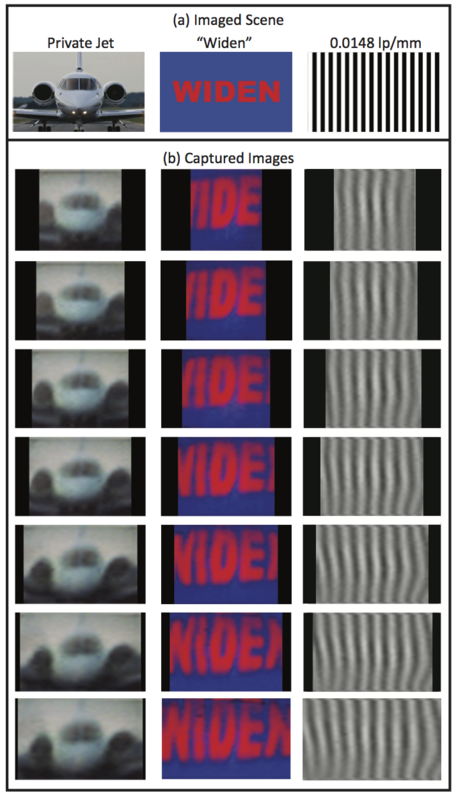 Images formed on the diffuser attached to the bottom of the sheet camera are captured using a digital camera and processed to produce images of scenes shown on the display. The prototype camera has a resolution of 33 by 33. Imaged scenes. 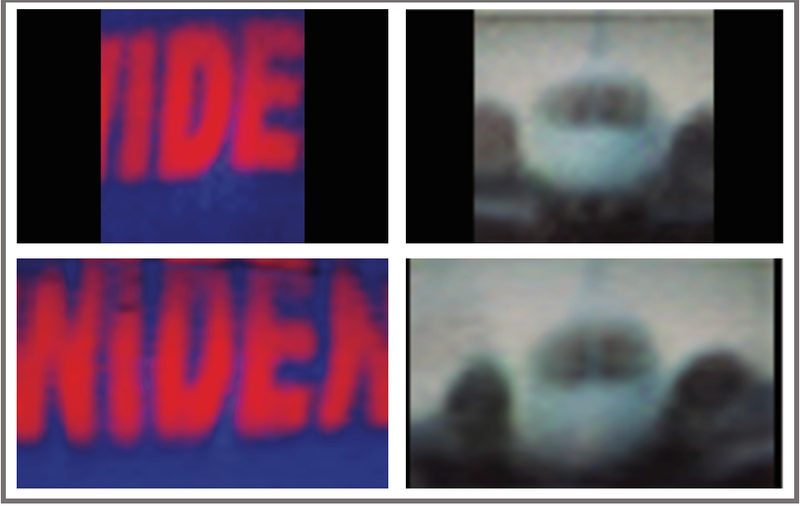 These three images - Private Jet scene, "Widen" text scene and a Ronchi ruling with a frequency of 0.0148 lp/mm - were displayed on a monitor above the Stretchcam prototype. Below that is an sequence of the images captured by the prototype Stretchcam as lens array is stretched. The aspect ratio of these images were adjusted using interpolation to account for the increasing captured region which starts at 231 mm and ends at 333 mm. The lens array was only stretched 3% of its original length to achieve 1.5 times zoom with each scene 300 mm away.